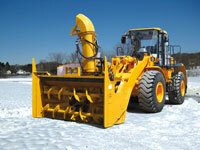 A powerful 205 kW (275 hp) Turbo Diesel Engine is powering this loader-mounted snow blower offering 2 stage dual auger. Built to be loader-mounted, the LM220 was designed for industrial use by cities, towns and the private industry. The LM220 can clear up to 2750 tons of snow per hour and cast snow up to 46 m (150 ft) either left or right through the drum or load trucks of any capacity via its telescopic truck loading chute. The RPM217 is a medium size 2 stage dual auger self contained loader-mounted snow blower, powered by a 151 kW (202 hp) at 2500 rpm electronic turbo diesel engine. 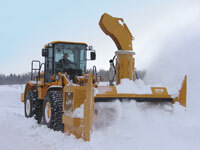 The RPM217, equipped with a telescopic truck loading chute, is used by cities, towns and the private industry and is capable of moving up to 2000 tons of snow per hour. The impeller can project snow up to 46 m (150 ft) with a rotation of 150° and a flat discharge to the right.